Rdio, the popular Internet radio service, on Thursday launched a major redesign of its mobile app which now aims to compete with the likes of Spotify and rival Pandora by bringing its ad-supported free Stations to 20 countries. The new look includes your personalized Home featuring an evolving mix of music stories based on your listening history and tastes, a new Browse section which now features both genre and curated Stations, a Trending feature showing what’s popular right now, the ability to favorite just about anything, from albums to artists to songs to stations, and much more. Rdio is free in the App Store. First up, there’s a brand new app icon to go along with the redesign. More importantly, a free version of the service is launching today in twenty countries, according to The New York Times which writes that the firm has partnered with Cumulus to sell ads in the United States. As I wrote a year ago, Cumulus operates some 525 radio stations in the United States and commands an advertising sales staff of about 1,600 people. Its content and services are worth an estimated $100 million. Cumulus is said to give the four-year-old Rdio service broad access to its programming and promote Rdio on its stations in exchange for “a significant equity stake” of at least fifteen percent in Rdio’s parent company, Pulser Media. This edition of Rdio also features curated stations from musicians and celebrities and a new way of discovering music similar to Beats Music where you use a slider to set a desired mood. Home — An evolving mix of music stories, personalized for you (coming soon to iPad). Favorites — Find something you love? Favorite anything from albums to artists, songs to stations, and keep them all in one place. All songs and albums from your existing Collection and playlists you’ve subscribed to now live here. Browse — Stations can now be found here, from genre stations to all-new curated stations for any mood. Trending — What’s most popular right now, combining Heavy Rotation and Top Charts. 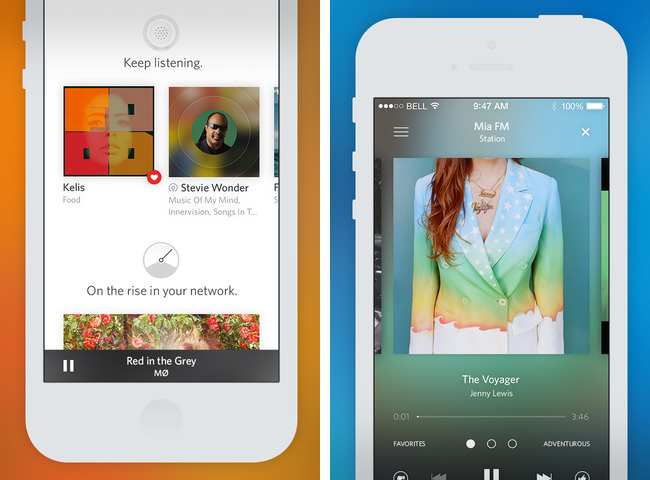 Rdio is betting big on the freemium model to grow its business. In 2013, music sales via subscription services like Spotify and Rdio contributed $1.1 billion in revenue to the $15 billion global music industry, as per the International Federation of the Phonographic Industry. However, a Midia Research study found that more than one-third of respondents who stream music online will not pay for music “because they get all they need for free from YouTube,” which is rumored to be prepping a paid music service of its own. By the way, Rdio was started by the creators of Skype. Available free in the App Store, the 47.6-megabyte download runs natively on any iPhone, iPod touch or iPad supported by iOS 6.0 or later. In addition to free Stations in select markets, Rdio also offers several subscription tiers, starting at seven bucks per month for unlimited listening everywhere, in addition to various Family plans and a 14-day free trial.